Zee Monodee: Random Thoughts' Monday: The Writer's Diet Is... Surprising! Random Thoughts' Monday: The Writer's Diet Is... Surprising! It's awfully hard to eat well when you're a writer! 1st constraint - time. Or 'lack of', actually. In a typical day, the writer who's also a mum & a homemaker, has to fit in everything that needs to be done around the house and write on top of that. 24 hours is just not enough - and ain't it a b*tch that we need 6-8 hours of sleep every night. I could really see that time going towards writing, but alas, I cannot function without sleep. 3rd constraint - we get in the zone, and if lunch time comes and goes when we're there (in that perfect la-la-land), forget the thought of food. So yeah - all of the above make it hard to follow a super duper diet and eat well and prepare fresh food and-- Arghh! Who does all that, except for Bree van de Kamp??? I could literally kill for something sugary - chocolate cake, anyone? - after a writing spree. But I'm trying to write everyday, and let's face it - you just cannot dunk a slice of chocolate cake with extra frosting every single day and expect to get away scot-free. What's a writer to do, for goodness' sake? And then I find the perfect solution - my ideal writing food. It's sweet, it's not that much of junk, it's filling, and it takes just 2 minutes to put it together, and about 5 more to dunk it down. What is it? A bowl of cold cereal with milk! 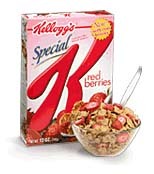 My poison of choice is Special K Red Berries with skim milk. On days when I'm writing, you can bet your paycheque I'll be falling on a bowl of cold cereal for lunch. If I'm lucky and my mum has taken pity on me and sent food over, then I just reheat whatever she's sent (my mum makes amazing Indian food! Whatever she sends, I know I'm in for a treat. Too bad her domestic goddess skills didn't deign inscribe themselves in my gene pattern...). But that's like, once a week, and the other days, well, I'm screwed. :) Cold cereal it is! What do you turn to? Do you have a specific writing food? And if you manage to cope with writing and making lunch, how on earth do you do it? Oh girl! This is so on the money! I feel the same way every day. I found that the easiest thing to cook are soups, especially in winter. Today, for instance, I made red lentil and spinach soup - all it takes is drop a bunch of veggies in stock, add some spices and boil for 30 mins, then add red lentils at the end and cook for another 15. The hardest part was chopping an onion and potato, but today one can find the frozen kind as well...so no work! The best thing is that it's healthy, and if I find myself getting hungry I'll just fill a small bowl and eat away. I even like it cold! I'm right there with ya girlies! Something fast is usually the best for me so I can break, get food and then get back to work. It's tough because most fast things are unhealthy (except for cereal) but cereal works in a jam. Especially if you want something light, healthy and a bit sweet. :-) Fruits and a smoothie also work! Lol, that's exactly it - something fast is needed!